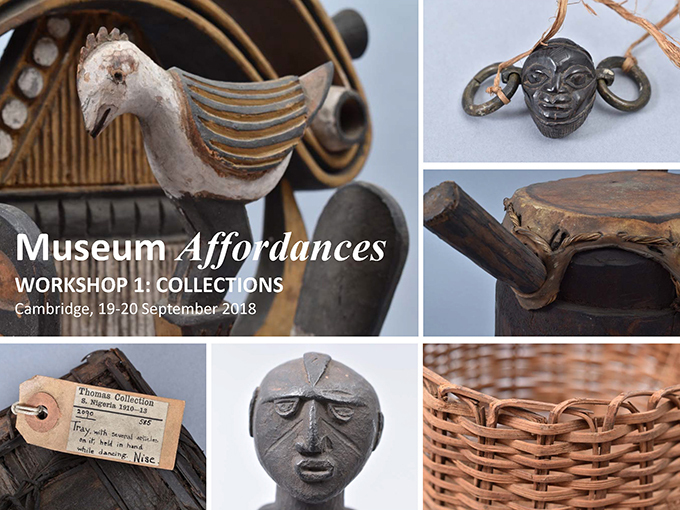 On 19-20 September 2018, the first of three workshops that we are organizing as part of the Museum Affordances project took place at the Museum of Archaeology and Anthropology, University of Cambridge. The workshops seek to bridge the worlds of museum and archives scholarship and practice, and critically explore the concept of ‘affordance’ in relation to different spheres of museum and archive work. The first workshop focused on collections; subsequent workshops – to be held in Berlin and Leiden respectively – will focus on museum interventions and museum exhibitions. One of the objectives of the workshop series is to contextualize our work with the N. W. Thomas collections and archives in relation to other innovative museum and archive projects currently taking place. One of the participants, Cécile Bründlmayer of the Humboldt Forum in Berlin, kindly agreed to write a guest blog summarizing some of the presentations and discussions that took place. I was recently fortunate to attend a two-day workshop with the title ‘Museum Affordances’ at the Museum of Archaeology and Anthropology in Cambridge. The venue served as an excellent background to kick off a series of three workshops over the span of three years which are loosely based around three broad dimensions of museum work, starting with the topic of collections and then continuing with the topics of interventions and exhibitions. 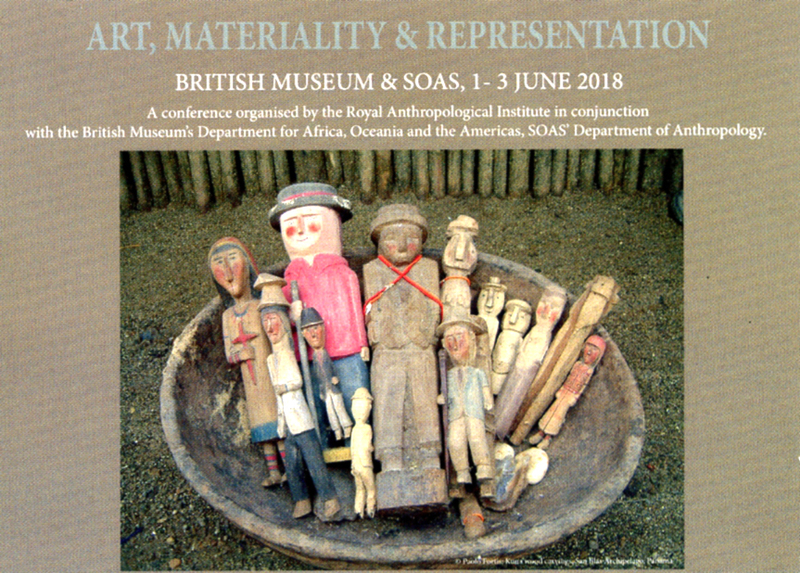 The workshops are part of a research project funded by the UK’s Art and Humanities Research Council which is engaging with a multifaceted ethnographic archive assembled by the colonial anthropologist, Northcote W. Thomas, in Southern Nigeria and Sierra Leone between 1909 and 1915. 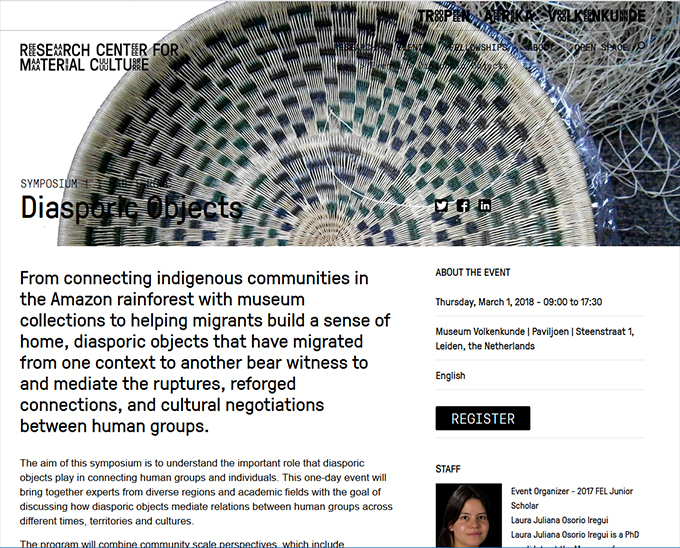 Within that context, the first workshop on collections served as a means to ask how the concept of affordances might help in order to address current questions concerning ethnographic museum practice. Applying the concept to specific case examples served as an interesting tool for experimental brainstorming which raised a lot of thought provoking questions. The workshop started with an introduction to the Museum Affordances project by Paul Basu (SOAS University of London, UK). He started by positioning the project within a broader context of questioning the continued relevance of ethnographic museums and their collections today, particularly confronting the colonial entanglements of these institutions and what these entanglements mean in a postcolonial or decolonizing world. He presented the concept of ‘affordances‘ which was developed in the 1970s by the American psychologist James Gibson who described the term in the following way: ‘The affordance of anything is a specific combination of (its) properties in light of what it offers, provides, or furnishes for the animal that perceives it’ (Gibson 1977). So while properties are objective phenomena with an existence independent of values and meanings, they serve as affordances only in particular combinations and relative to particular actors. Based on this concept, the following questions where discussed throughout the workshop: What do museums afford? What do they make possible? Presentations from Chris Wingfield and Michae Aird in the ‘Changing contexts’ panel. The first panel dealt with examples of how the changing of time and context affects the perception of particular affordances. Dan Gilfoyle from The National Archives (UK) opened the panel with a talk about the archive of the Colonial Office which was responsible for the overall administration of the British Empire. The Colonial Office gathered an enormous amount of documentation about the Empires’ administration, from correspondence letters to maps and photographs. From the 1870s on the Colonial Office appointed scientific specialists to work in and for the colonies: one of them was the anthropologist, N. W. Thomas. Despite some small achievements in language teaching for colonial officers, his work wasn’t considered a success during his time and the results of his project have remained hidden in the archives for over 100 years. The affordances that Thomas’ collections might offer are therefore latent and unused. While Thomas’ work didn’t afford much in the eyes of his past employers, what might it afford today? Chris Wingfield, senior lecturer at the Sainsbury Research Unit for the Arts of Africa, Oceania & the Americas (UK), then shifted the focus to the London Missionary Society, its history and questions of affordance and affordability. Based on the collecting history of the London Missionary Society, he reflected on the tension between affordances and affordability. If affordances are unlimited, he asked, how is it possible that only some of them are activated and others are not? How are the affordances of collections affected by institutional considerations, including judgments of value and cost? How do people negotiate affordability? As he showed with the example of the London Missionary Society, the perception of affordability of collecting or of an existing collection changes throughout time. The same collection can be considered useless in one context and useful in another. Michael Aird from the Museum of Anthropology at the University of Queensland (Australia) then continued to reflect upon his exhibition ‘Transforming Tindale’, which was shown at the state library of Queensland in 2010. In that exhibition, he displayed a collection of photographs taken in 1938 by the prominent scientist Norman Tindale, an Australian anthropologist who documented about 5,000 Aboriginal people for the government. As part of the exhibition, Michael Aird reunited the photographs with their depicted subjects or their descendants. As most of the people that have been photographed by Tindale were on governmental reserves and had no chance to refuse to be photographed, Aird’s presentation prompted a long debate about the ethics of exhibiting photographs that where taken under forced conditions. Presentations from George Agbo, Philipp Schorch and Dean Sully in the ‘Engaging with collections’ panel. George Agbo, a postdoctoral researcher on the Museum Affordances project based Museum of Archaeology & Anthropology, University of Cambridge (UK) opened the second panel by asking what digital photography affords when working with collections, taking his own work with the N. W. Thomas collection as an example. He pointed towards the ability of digital photography to get closer to the objects and to be able to reunite objects that were originally collected together but which have become separated in the museum stores. He also stressed the affordance of digital photography to put the collection online and circulate it. What happens when you do that? He provided examples of discussions from the project’s own Facebook Group, which has a growing number of Nigerian and Sierra Leonean members. Finally, he discussed different methods of photographing the objects and the specific qualities of a photographed object. How to capture the integrity of an object? What happens when you manipulate the background of the object? Is the environment not part of the object? And what are the things that photography cannot afford, such as the smell, sound or touch of an object? Philipp Schorch from the Staatliche Ethnographische Sammlungen Sachsen (Germany) then continued with a presentation about an experiment he undertook together with his students and the German art historian/philosopher Bruno Haas. Based on the example of a Tatanua mask from Papua New Guinea, he started with the following questions: What can a mask tell us? How can we see the mask for what it is and not for what it supposes to represent through a typical anthropological or art historical lens? By referring to Bruno Haas’ recent work, ‘Die ikonischen Situationen’, he tried to come closer to the structures that show themselves in the singular piece, starting with the specific formal qualities of the object, and ignoring preconceived notions such as ritual or ethnic group, in order to approach the mask in all its individuality. Finally, Dean Sully, from the Institute of Archaeology, University College London (UK) took us through the everyday life of a conservator and revealed the tools, techniques and thought processes that come together in contemporary museum conservation practice. He presented heritage conservation as a broader analysis of the past which affords an understanding of the world from the traces left behind by people. The analytical process of conservation reveals how museum objects may have been used in the past, how they transmitted agency to the present and how they impact the lives of people now and in the future. Through the enduring presence of heritage places and objects cultural practices can be rethought, reimagined and revitalised continuously. Presentations from Rita Ouedraogo, Maria-Katharina Lang and Chris Morton in the ‘Whose affordances’ panel. The second day of the workshop started with a panel focusing on questions of affordances related to collaborative work. Rita Ouedraogo from the Research Centre for Material Culture at the Nationaal Museum van Wereldculturen (The Netherlands) started by presenting a project she conducted within the context of the 60-year celebration of Ghana’s independence. For the project she invited people who feel a connection to Ghana to look at the Ghanaian objects in the collections of the Tropenmuseum and choose objects that related to them. After several months of talks, meetings and depot visits, one person became intrigued by a Fanti canoe, which became the centre of a series of discussions. What does the canoe represent or make possible for the differently-positioned participants of the project? What does the object afford to whom? Do all such affordances co-exist harmoniously? Maria-Katharina Lang from the Institut für Sozialanthropologie, Österreichische Akademie der Wissenschaften (Austria) then continued to present her work with a collection from Mongolia, which was gathered by the Austrian natural scientist Hans Leder during the second half of the 19th century. Shortly after the objects arrived in Europe, Buddhism was forcefully eliminated in Mongolia, monasteries were closed or even destroyed. With her project, which was called called ‘Nomadic Artefacts‘, Maria-Katharina Lang tried to reassemble the dispersed collection, which got distributed among different museums. She then linked the objects with specific regions and people and conducted interviews with monks, herders and museum workers in Mongolia about the collection and its meanings. The results of the project were presented in an innovative exhibition and website. Chris Morton from the Pitt Rivers Museum, University of Oxford (UK), then continued with a presentation about a collection of physical anthropology photographs from Botswana, discussing its original context and his recent work with the community. The collection comprises photographs of the San people in Botswana taken by the anthropologist Joseph Weiner in the 1950s. Weiner was part of an expedition into the central Kalahari, where he led one of the physical anthropology sub-sections. The latter focused his work on taking blood and hair samples, measuring skin color, genitalia, muscle strength, weight measure and photographs, based on a systematized method to document physique. Despite the huge effort, the work was not successful and the methods fell into disrepute – an example of ‘false affordances’, in which the project failed to deliver what it promised. Chris Morton asked what the photographs might afford the communities in which they were taken today and presented some preliminary findings in which the photographs were perceived very differently. While the photographs represent an anthropological ‘dead end’, how might they be useful for the future? Who decides what the future of such a collection is? Presentations from Michael Barrett, Annette Schmidt and Tal Adler in the ‘Difficult histories’ panel. Michael Barrett, curator at the Varldkultur Museerna, Stockholm (Sweden) opened the panel with a presentation of a project he started in 2017, a long term public engagement in collaboration with people of African descent in Sweden whose purpose is to adopt new perspectives in order to make the museum more relevant for a broader and more engaged audience. In the course of a workshop series called ‘Encountering the collection’ he tried to ease out previously unacknowledged affordances of the collections together with the participants. His case study showed that ethnographic collections may afford some aspects of a utopian ‘Afropean’ museum, which includes highlighting and questioning cultural and social identities. The project also afforded uncovering entangled histories between Sweden and Ethiopia which allowed a reflection on the historical development of African identities in Europe/Sweden. Annette Schmidt from the Nationaal Museum van Wereldculturen (The Netherlands) then shed light on the hidden affordances of so-called ‘tourist art’ from the Museum’s Lower Congo collection in order to unpack the local perspective on life in the region during the period 1850 to 1908, covering a time frame in which power relations between the local rulers and the European traders changed dramatically. Annette Schmidt emphasized the potential of tourist art as representatives of the local Congolese view of Europeans. Can it provide a new perspective on the history that for so long has been told from the perspective of the colonisers? Sharon Macdonald and Tal Adler from the Centre for Anthropological Research on Museums and Heritage (CARMAH) at the Humboldt Universität zu Berlin (Germany) concluded the panel with a talk about the project ‘TRACES’ (Transmitting Contentious Cultural Heritages with the Arts, From Intervention to Co-Production) which allowed artists, researchers and museum staff to engage on a long term basis with ethically problematic collections. Tal Adler presented his work on a collection of human skulls and photographs from the Natural History Museum in Vienna and showed clips of a film that resulted from his work. 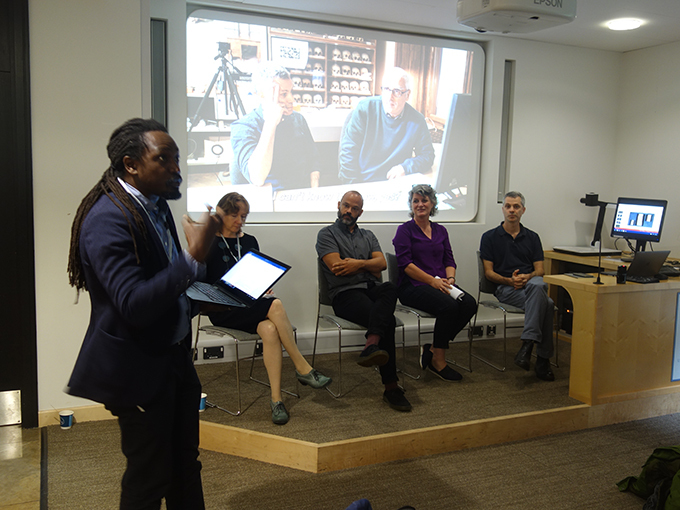 Ikenna Onwuegbuna chairing the ‘Focus on sound’ session, ,with Yvonne Mbanefo and Janet Topp Fargion. Finally, the last panel focused on sound archives. Janet Topp Fargion from the British Library (UK) presented her work at the British Library Sound Archive and the challenges of making its large collection available (online and offline) to all kinds of communities. She emphasized the importance of recirculating the collections in order to keep languages and cultural traditions alive. She provided examples of the connections with communities being made through the sound elicitation work being done as part of the Museum Affordances project. 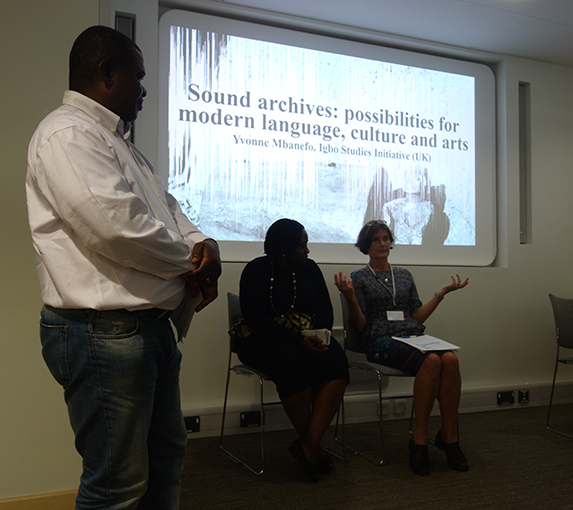 Yvonne Mbanefo from the Igbo Studies Initiative (UK), then gave a talk about the possibilities of historical sound recordings and what can be done with it. Alarmed by the language and culture decline in Nigeria, she started to record oral histories in her native language Igbo which triggered strong interest in many different groups. With the example of two audio files from the N. W. Thomas collection, she demonstrated the creative possibilities inherent in these recordings. She demonstrated how one of Thomas’s recordings of a traditional folktale could be transcribed, translated and re-recorded, forming the basis for a Igbo language training resource for children. From linguistic information to the creation of text-based T-Shirts in the Igbo language or inspiration for rap-songs and new choreographies, Yvonne Mbanefo argued that the possibilities to create something new out of old sound recordings are endless. The more museums involve the community the more ideas can be found. Wayne Modest leading the discussion after the ‘Difficult histories’ panel, with Sharon Macdonald, Michael Barrett, Annette Schmidt and Tal Adler. Throughout the workshop, questions and discussions opened up a variety of different topics concerning the usability of the concept of affordances for museum practice. All presentations made clear that affordances change over time and that while the possibilities they enable are seemingly endless, they are still limited by certain restraints which are connected to certain institutional, academic or historical contexts as well as to ethical or political views. It became clear that museum affordances are made up of latent relations between things, people and intentions, which are interdependent, changeable and in constant mutual exchange and can be (re)activated within different contexts. Haidy Geismar stressed the tension between the ecological definition of affordance by James Gibson which is about understanding the entangled nature of things and their environment and the idea of a pure and unmediated engagement with an object. How can we stick with the ecological complexity? And what does engaging with the object really mean? An important topic circulated around questions of how to find ways to apply the concept of affordances within museum practices and what ethical and political questions emerge while doing that. When opening up a collection and making all affordances accessible, isn’t there also a danger of losing control over misuse and misapplication? How to deal with this tension of wanting to make the collection and its affordances accessible while having to consider ethical and political issues at the same time? With reference to Michael Aird’s ‘Transforming Tindale’ exhibition, Sharon Macdonald asked about the limits of aesthetization, which prompted a long discussion about the aesthetization of potentially discriminating photographs. How far does one affordance play off against others? How do you decide if a photograph can be shown or not? Does the strength of the people looking into the camera transcend their status as victims, as Michael Aird suggested? Nicholas Thomas argued that it is not constructive to stick to a rigid methodology in order to judge if some photographs are appropriate and others are not. Deciding whether or not photographs are potentially hurtful is a social process and always depends on the specific objects or photographs and what people are doing with them or how they respond to them. The discussion then turned towards the question of the responsibility of the curator concerning the openness of contentious collections. Who should be allowed to use them and for what? And what role does the institutional context play? What is the difference in storing or exhibiting problematic collections in ethnographic museums, art galleries or natural history museums? The presentations of collaborative projects then prompted discussion on how these projects serve to rethink the ethnographic archive and push beyond their original intentions. Can the ethnographic museum be reframed not as a problematic site, but as a more hopeful place for discussing identity in a novel way? Finally, with regard to the last two presentations, Wayne Modest asked about the affordance of sound in relation to the visual. Does it afford something different? By pointing to the large amount of research that has been done on the nature of sound, Janet Topp Fargion stressed the immersive quality of sound which has the ability to trigger strong emotional reactions. When seeking to reveal the hidden affordances of museum collections, audio recordings have as much potential for collaborative projects as material objects or photographs do. Cécile Bründlmayer studied Social and Cultural Anthropology and Fine Arts in Vienna and currently works as research associate and curator at the Humboldt Forum in Berlin. Prior to this she worked at the Weltmuseum Wien (former Museum of Ethnology, Vienna) during the process of re-establishing and reconceptualising the entire new permanent exhibition.